In May 2016 I decided to have an adventure and travel by free bus pass from Oldham to Paignton to visit my family who lived there. I’d done that journey many times by train, coach, plane and car and needed a change! It took me 4 days, staying overnight in 3 Hanover Housing Association (of which I am a resident) guest rooms at Walsall, Redditch and Bristol. I travelled on 24 buses, spent £40 on accommodation and NOTHING on transport. I met some fascinating people, journeyed through beautiful countryside, explored several towns, made copious notes, took a photograph every hour, and frequented as many Wetherspoons as I could – if only to use the loo! I loved every minute and vowed I would soon be planning my next trip. That same year I completed 4 trips in total, each one lasting about 5 days, and covered the country from Newcastle to Carlisle in the North and Paignton to London in the South. At about the same time as my first trip I read an article on Facebook about a Leeds-born man called Edmund Platt who went to live in Marseille and was so appalled by the amount of rubbish in the city that he began a campaign called 1 Piece Of Rubbish, to try to encourage everyone to pick up at least one piece of rubbish every day. 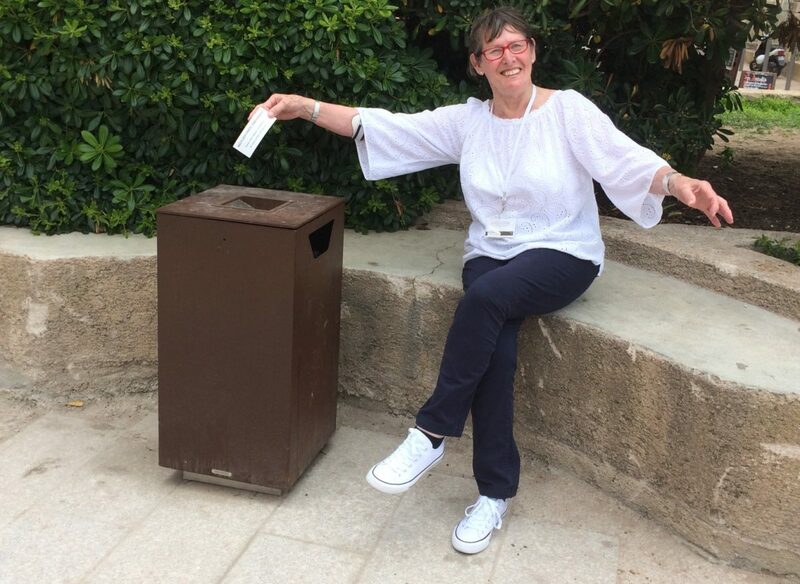 This was such a simple idea that I decided to incorporate it into my travels and very soon I was taking photographs of my hand putting rubbish into bins, in every town and city I visited. I posted them on Social Media sites to try to gain momentum for the campaign. Later that year the Oldham Chronicle published an article about my venture and this was followed by a meeting with Oldham Council who agreed to support and promote the campaign throughout the Borough. As with all things to do with bureaucracy the wheels turned exceedingly slow and it wasn’t until late 2017 that the Council’s involvement picked up speed. However, in the meantime, I had completed 4 more long bus pass trips and had gathered my own momentum by printing ‘business cards’ which I handed to anyone and everyone who seemed to be the least bit interested in picking up rubbish. I also attached a flag onto my back pack to announce that I was picking up #1PieceOfRubbish every day and it certainly helped to create interest and the beginnings of many conversations. Support for the campaign increased manifold when Oldham Council produced a video promoting a competition to encourage residents to send in photographs of their litter- picking antics and this drew the attention of various business/voluntary/community and activity groups as well as individuals. In November 2017 another competition encouraged local schools to become involved. Spreading the word is the biggest issue to overcome and I believe that local businesses could (and should!) make a huge impact here. What better way to encourage investment into the area than to present to the world a clean, pleasant and environmentally -friendly borough? Why not encourage employees to do their bit by creating incentives or launching competitions to create awareness? Could they provide prizes, organize litter picks, post amusing photographs on social media? As far as I am aware no other town in the country is promoting and developing this campaign. Wouldn’t it be wonderful if, together, we put Oldham ‘on the map’? 1 Piece Of Rubbish is a very simple concept, costs nothing to execute or implement, encourages a little gentle exercise out in the fresh air and can create a feeling of fulfilment, environmental awareness and the knowledge that each and every one of us can be part of an ecological movement – any day, any time, anywhere. Everywhere I go I talk a ‘load of old rubbish’ – to people in the street, on trams & trains, at airports, in pubs and restaurants, on cruise ships and in foreign lands. But my main passion is to continue travelling by bus pass around England, not only to promote the campaign but to simply have fun! I’m due to set off on Bus Pass Trip No.11 on the 3rd July and another journey for early August is already in the planning stage. Watch this space! What a wonderful website Ruth, well done. You have certainly inspired me to do my bit. Thank you, Dorothy! Great to have you ‘on board’! I’ve known Ruth now, for a number of years & when she ‘gets the bit between her teeth’ she does what she says she’ll do – unlike most of us, who only ‘talk the talk’! So ‘good onya Ruth, more power to your elbow (literally) & keep making a difference’! I hear of your rubbish travels from Eileen Green, like you I can’t stand to see litter and anyone who does their bit to highlight the issue does change the way the area looks and at times change peoples bad habits. I have to say that your determination in this project is amazing, well done. I wish you many, many more of your rubbish travels. How lovely to hear from you and thank you very much for your kind comments. I have to admit that, since starting to promote this campaign, I’ve had the greatest fun, met (and heard from!) some wonderful people and developed my computer skills beyond expectation. If, at the same time, I can make a small difference to the environment then it’s a win-win situation all round. I’m loving it!!! Look out for new posts from my next trip VERY SOON! Next Next post: A Brief History Of My Hand!